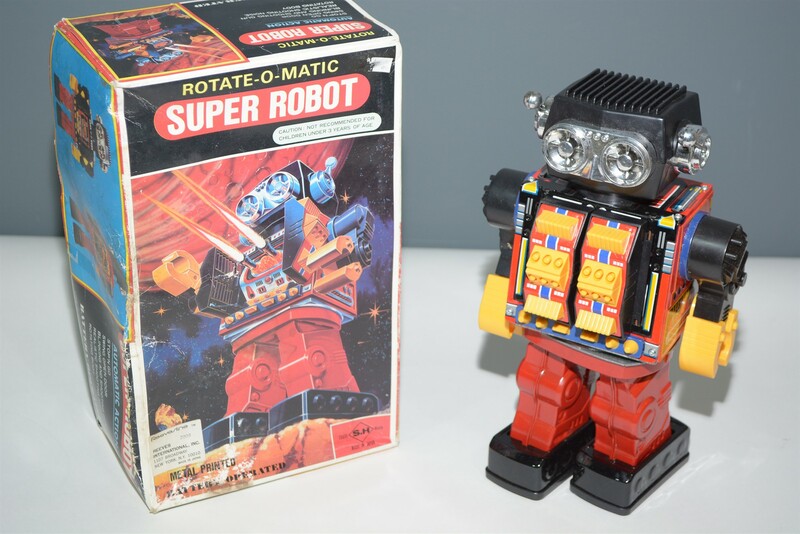 SH Horikawa Rotate-O-Matic Robot, Japan, tin plate, boxed. Unfortunately, your registration has been declined by the auctioneer. You can contact the auctioneer on +44 (0)191 4303000 for more information. Anderson & Garland Ltd do not offer a postage or packing service. We ask buyers to arrange this themselves after payment has been made. Need to have it packed and delivered? Mail Boxes Etc pack and ship for most of the UK’s major auction houses and now offer a total door to door service to all Anderson & Garland Ltd clients. PLEASE BE AWARE THAT PAYMENT OF THE ITEMS MUST BE MADE BEFORE CONTACTING ANY SHIPPERS OR PACKING AGENTS. PLEASE GIVE CHEQUES 5 WORKING DAYS TO CLEAR. PLEASE NOTE WE DO NOT UNDERTAKE ANY POSTAGE OR PACKING – PLEASE CONTACT MAILBOXES, NEWCASTLE ON: 0191 222 0018. In these Conditions Anderson & Garland Ltd. who act only as auctioneers and agents for the vendor, are called “The Auctioneers’’, and the representative of Anderson & Garland Ltd. conducting the auction is called “The Auctioneer’’. with all faults, imperfections and errors of descriptions. so to certify, and in such case the Auctioneers do so as agents of the vendor and are not themselves responsible for such claims. (c) All statements, whether printed in the catalogue or made orally, as to any of the matters set out in (b) above are statements of opinion only and are not to be taken as being or implying any warranties or representations of fact by Anderson & Garland Ltd., unless they have been instructed in writing by the vendor so to certify, and in such case the Auctioneers do so as agents of the vendor and are not themselves responsible for such claims. (d) Any claim under any Statute must be received in writing by the Auctioneer within ten days of the day of the sale. sale, to refuse bids, regulate bidding or cancel the sale without in any case giving any reason or without previous notice. He may bid on behalf of the vendor for all goods which are being offered subject to reserve or at the Auctioneer’s discretion. (b) The highest bidder shall be the buyer except in the case of a dispute. If during the auction the Auctioneer considers that a dispute has arisen, he has absolute discretion to settle it or to re-offer the lot. The Auctioneer may at his sole discretion determine the advance of bidding or refuse a bid. (c) Each lot is put up for sale subject to any reserve price placed by the vendor. Where there is no reserve price (but not otherwise) the seller has the right to bid either personally or by any one person (who may be the Auctioneer). (e) Vehicles: Can all potential new bidders wishing to bid on a vehicle, please be aware that prior to the sale, they will need to provide full ID in the form of a driving licence/passport and a copy of a utility bill. Agents buying on behalf of a third party must have written authority from their principal clearly stating their authorisation to bid. We will also require a 10% deposit of the lower estimate at the time of registering, which can be done during the viewing period. If unsuccessful, then we will issue a refund immediately. Please check further auction details as vehicles are usually but not exclusively sold at midday on auction day. Chartered Surveyors. Both the buyer and the vendor agree to be bound by the decision. accepted at the sender’s risk and must be confirmed in writing forthwith. or has been repaired or restored. We will be happy to provide a condition report and additional images upon request. Whilst every care is taken to photograph lots accurately, it is only possible to give approximate representations in our catalogues, on our website and elsewhere. Images are for general guidance only, and colours in particular will vary – especially when viewed on a screen. Bidders are directed to item 7 of our General Conditions of Sale and are advised to attend our viewing days. We cannot accept returns on the basis of inaccuracies caused by the limitations of photographic reproduction. shall forthwith pay to Anderson & Garland Ltd. such proportion of the purchase price as the Auctioneer may require. If the buyer fails to do so, the lot may at the Auctioneer’s sole discretion be put up again and re-sold. Ltd. that he acts as agent on behalf of a named principal. (a) No purchase shall be claimed or removed until it has been paid for and the sale has been concluded. All purchases shall be paid for and removed at the buyer’s risk and expense by the end of the third working day following a Town & County sale or Specialist sale and by the end of the fifth working day following a Fine Art sale, failing which the Auctioneer shall not be responsible if the same are lost, stolen, damaged or destroyed. All lots not so removed shall remain at the risk of the buyer and at the end of seven days (one week) following the sale, goods not collected will be placed in a temporary storage area, the buyers account charged with £20 + VAT administration fee and will be subject to a minimum warehousing charge of £1 per lot per day thereafter. If they are not paid for and removed within seven days of the sale the Auctioneer may re-sell them by auction or privately without notice to the buyer. Any liability which there may be on the part of the Auctioneer in respect of any loss shall be restricted to a maximum of the price paid by the buyer of the lot. (b) Goods will only be released to the successful bidder who can produce proof if identification. In the case of third party/courier collection we will require written instructions from the buyer who must have paid prior to collection. Any buyer paying by cheque must wait seven days for funds to clear. We are unable to accept any card holder not present transactions ie telephone payments or card details via email - should you wish to pay with a card please use the facility on our website or call into the auction house in person. (c) In the event of any failure of the buyers to comply with any of the above conditions the damages recoverable by the seller or the Auctioneers from the defaulter shall include any loss arising on any re-sale of the lot, together with the charges and expenses in respect of both sales, and together with interest at 2% above Barclays Bank PLC Base Rate upon the price of any lot which has not been paid for within seven working days of the sale, and any money deposited in part payment shall be held by the Auctioneers on account of any liability of the defaulter to them or to the seller. Cheques drawn by third parties, whether in the Auctioneer’s favour or requiring endorsement, cannot be accepted. (d) Although Anderson & Garland Ltd. do not offer a post and packing service they are pleased to recommend Mailboxes etc. Newcastle who can be contacted by email info@mbenewcastle.co.uk or telephone 0191 222 0018. The purchaser shall pay the hammer price together with a premium of 20% of the hammer price (adjusted for VAT as necessary). The premium at the appropriate rate is payable by all purchasers. The amount invoiced will be the hammer price plus premium adjusted for VAT (where VAT is chargeable) but the VAT will not normally be recoverable by the buyer. This will be pllied at the point of sale and an invoice will be issued to the buyer wich will be marked as paid upon receipt of payment in full. The vendor authorises the Auctioneer to deduct commission and expenses at the stated rates from the hammer price and acknowledges the Auctioneer’s right to retain the premium payable by the purchaser. hour before the sale commences, and should be entered on the forms provided. Bids left by telephone or e-mail will be accepted only on the condition that they are at the sender’s risk, and in the case of verbal instructions must in any case be confirmed in writing. Telephone bidding is not currently available for Town & County Sales. bed of any lake, river, stream or other area of water therein or from the bed of the sea within the territorial waters of the United Kingdom (other than coins or articles recovered only after burial or concealment at a date less than 50 years before the date of exportation). years old irrespective of value. However, firearms over 100 years old may still require a certificate for possession in the U.K.
exceeds the UK sterling equivalent of 1,000 euros. threshold levels, please see www.dacs.org.uk. There is no VAT payable on this royalty charge. For all questions relating the regulations regarding Droit de Suite royalty charges, please see www.dacs.org.uk, telephone +44 (0) 845 410 3410, or email arr@dacs.org.uk.